The link between tabletop gaming and videogames is a pretty strong one, with games from BattleTech to Baldur’s Gate relying heavily on the formula popularised by Dungeons & Dragons. 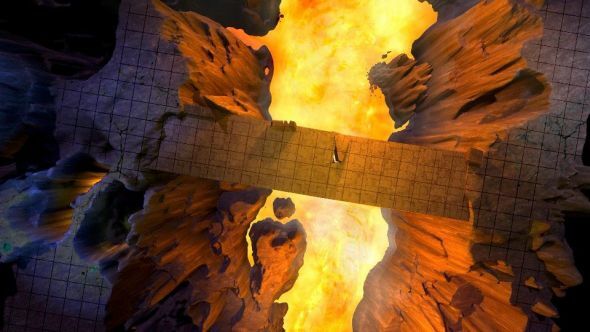 If you like your gameplay low-tech but enjoy the visual detail offered by modern technology, you might enjoy Dynamic Dungeons, a project designed to offer ‘living’ environments to accompany your tabletop games. The idea is simple, riffing off simple backdrop designs for standard fantasy roleplaying settings – caves, dungeons, wildernesses, etc. What Dynamic Dungeons does, however, is animate these scenes, adding wildlife, tree branches that sway in the wind, and day/night cycles. A particular highlight is an enormous galleon breaking through the waves, sales billowing, and seagulls wheeling overhead. If you prefer some higher-tech roleplaying, here are some of the best RPGs on PC. Using the maps is reasonably simple – just upend a TV or use a tablet to use the maps’ grids to play on (you may want to invest in some form of screen protector). To get access to them, you can visit the Dynamic Dungeons patreon page. There, based on how much you pay, you get access to more sophisticated maps. $1 per pack offers a still image of the map, while $2 or more offers fully animated maps. Pay $5 and you’ll get access to day and night versions of the maps. You can get an idea of exactly how they look in the video below. There are roughly three to four new map packs uploaded for backers every month. May’s offerings so far include the galleon mentioned earlier and an Ancient Ruins map. Signing up as a back at any level grants access to every map uploaded so far.